They’re a little stumpy, due to the unfortunate anatomy of my gingerbread man cutter, but suitably spooky for Hallowe’en, I think. Also, they’re very simple to make, compared to how impressive they look. Technical specs: Vanilla sugar cookie recipe from Peggy Porschen’s Pretty Party Cakes. Royal icing made from a packet mix, mixed to a pretty soft Soft Peak stage (a bit too soft, I think), number 2 writing tip. This entry was posted in Cakes etc. Bookmark the permalink. 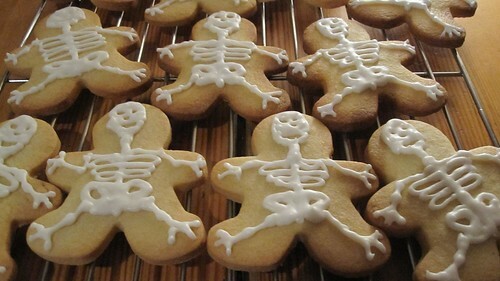 i’m going to have a crack at making these – hopefully it’ll earn me some brownie points at home. 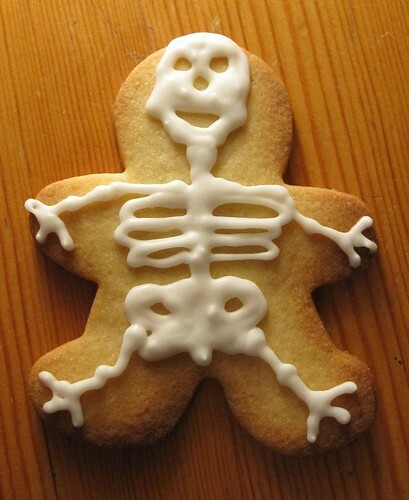 Give ’em a go – you could do dinosaur skeletons, fish bones, anything!